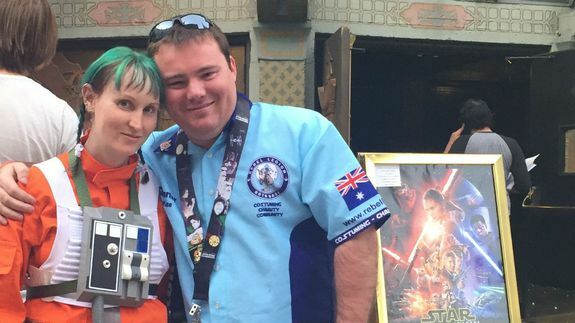 Meet the couple having a Star Wars-themed wedding at TCL Chinese Theatre on opening night - trendistic.com: ever tried. ever failed. no matter. try again. fail again. fail better. LOS ANGELES — While Caroline Ritter has done the roughly 15-hour flight from Australia to L.A. two times before to see Star Wars films on opening night at TCL Chinese Theatre IMAX in Hollywood, this time will be extra memorable. Before the Star Wars: The Force Awakens premieres, Ritter will be having the themed wedding of every Star Wars fan’s dreams at the historic theater.